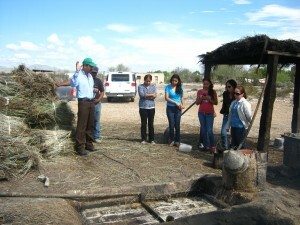 When Dr. Jaime Sánchez from Universidad Juarez in Mexico’s Durango state contacted the Candelilla Institute to arrange a field trip for his students, Multiceras S.A. de C.V. was pleased to coordinate a visit for the students, who are studying natural resource exploitation and wanted to witness the candelilla wax extraction process first-hand. The students, accompanied by Dr. Sánchez, visited a production site in a locality near Saltillo, Coahuila, where Multiceras staff greeted them and facilitated a demonstration of the entire candelilla wax extraction process — from placing the candelilla plants in iron cauldrons (called pailas) with a mixture of water and acid to boil, to removing the hot foamy wax that floats to the surface using utensils with openings called espumaderas (foamers). Afterwards, the group visited the Multiceras warehouse to take in a presentation about the company and its social responsibility program. The Candelilla Institute and Multiceras are pleased to have been part of the education process for these students and look forward to other opportunities to provide similar experiences for students who want to see how natural resource exploitation can be done sustainably or who want to research new techniques that can be implemented in the region.